Today’s object from the Stirling Smith collections is an arts and crafts oak cabinet which has a door decorated with gesso. It was made by the furniture maker Henry T. Wyse and was part of the furnishings of No. 1 The Homesteads, Stirling. It was left to the Smith by Ailie Maclaurin (1913 – 2000), daughter of Robert Maclaurin (1871 – 1948) who established The Homesteads in 1911 as a garden city development where the householders could aim for self-sufficiency thanks to the generous amount of land surrounding each house. Maclaurin was an inventor, scientist and businessman who developed the energy saving white flame heating system. Originally based in Glasgow, he had issues with Glasgow Corporation and published the pamphlet A Peep at the Glasgow Gas Scandal, before leaving to live in Stirling. He brought with him the Scottish Guild of Handicraft, from Glasgow to Burghmuir, Stirling in 1909. 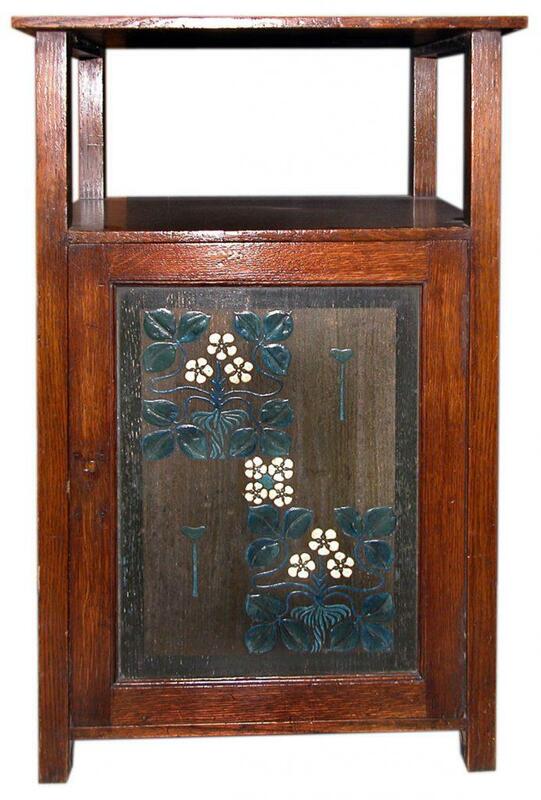 The Guild was a co-operative partnership which produced art pottery, furniture, metalwork and stained glass in the style which is known as Arts & Crafts. The partners worked in the belief that homes should have furnishings and fittings which were functional, simple and also well – designed. The cabinet by Wyse is an outstanding example of the style.